You can’t do it alone. If you want to scale your company and achieve those big, audacious goals, you need an engaged, aligned team to turn your vision into a reality. Unfortunately, many companies aren’t focusing enough attention on employee engagement. According to a recent IBM Smarter Workforce Institute Study, 75% of high-performing workers would be interested in a new job at a different organization if presented the right opportunity. The same study found that 70% of all millennials are already planning their next move! 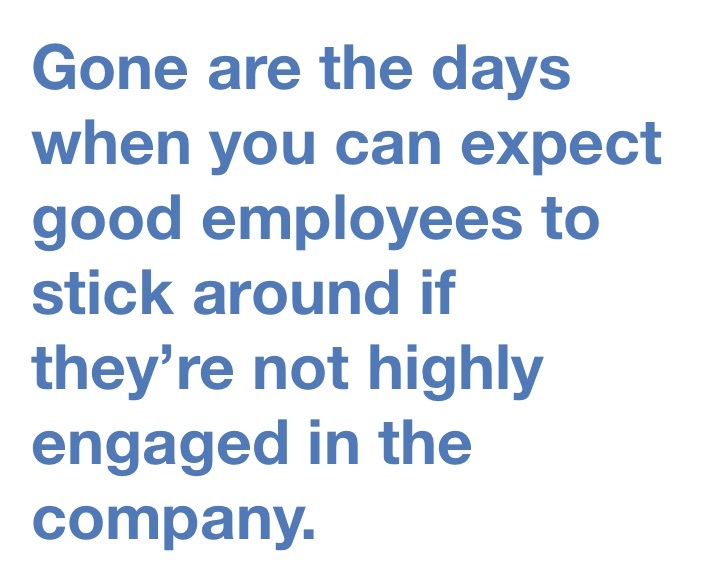 Gone are the days when you can expect good employees to stick around if they’re not highly engaged in the company. What can you do to engage your employees -- so they have a passion for their work, feel a profound connection to the company and its purpose, push for innovation and have a relentless desire to help move the organization forward? Engagement starts on day one. Are you making a team member’s first day something to celebrate? Are they saying “Best Day Ever” and can’t believe how fortunate they are to join your company? Focusing on the onboarding process so that the new hire immediately feels welcomed and a part of the company culture is the perfect time to set the stage. Celebrate regularly. Are you highlighting people and company wins whenever you can? Recognition is a huge motivator. It not only makes employees feel valued for their work, but also increases productivity and loyalty to the company which leads to higher retention. Employee journey. Does your workforce know what their growth opportunities are? Are you investing in their learning and development and helping them improve their skills? The LinkedIn Global Job Seeker Trends report states that the #1 reason employees change jobs is lack of career advancement opportunities. Open communications. Is there regular communication to keep your entire team informed about strategy, top priorities and key metrics and how their work aligns with the big picture? This transparency increases their passion and connection to the business. Seek feedback. Are you regularly surveying your team members about their experiences within the company and taking action on the results? I especially like the powerful Net Promoter Score (eNPS) question, “On a scale of zero to ten, how likely is it that you would recommend this company as a place to work?” Calculating the results will quickly allow you to distinguish your promoters, passives and your detractors. Bottom line: The importance of employee engagement can’t be overstated. It will reduce turnover, improve productivity and efficiency, retain customers at a higher rate and improve profitability. And most important, engaged employees are happier, both at work and in their lives! Older PostAre You Trapped in the Shiny Object Syndrome?